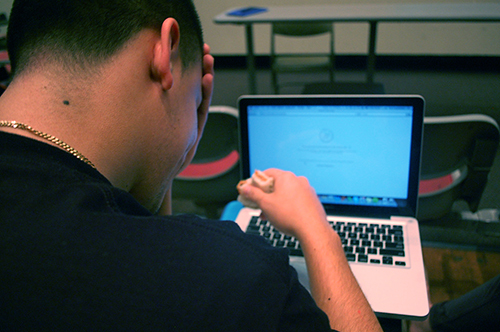 Two weeks into the spring semester, junior biology major Darius Mugg ran his hands through his hair while scrolling through Blackboard on his computer in the North Reading Room. Twenty assignment tabs crowded the dim space at the top of Mugg’s crusted Intel laptop, whose spacebar hadn’t worked since he spilled a thermos of piping hot coffee over the keyboard and his right hand two weeks ago. He suffered second-degree burns in the process, and his two-day hospitalization cost him an unexcused absence in organic chemistry after his professor called him a “whiny baby” in front of a 200-person lecture. Mugg assured The Onion Bagel that his injuries and rapidly-accumulating pile of spacebar-centric online work had done little to dull his optimistic mood for the spring. “Positive vibes” also seem to be helping sophomore and quadruple biology, information systems, art history and social work major Alexa Ludgate cope with her semester’s heavy workload. While her friends cautioned her to drop a major and her parents called an exorcist just the other day, Ludgate assured them and the rest of the campus that she was fine. Ludgate also told The Onion Bagel that her stress led her to long, pensive YouTube-watching sessions, which has coincidentally convinced her that the nation of Paraguay does not actually exist. Echoing Ludgate’s sentiments, senior applied mathematical systems major Michaela Chang added that it might be easier to get through her nightly assignments if “pestering, worm-people reporters for The Onion Bagel” weren’t constantly accosting her as she studied in the Social and Behavioral Sciences (SBS) building. After escorting a violently resisting student out of the SBS building, University Police Department Officer, Johnald Shamrock, expressed his sympathies for Stony Brook’s hard-working student body.